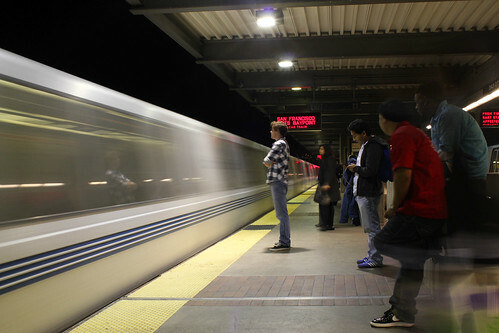 People wait for a Pittsburg/Bay Point-bound train at Daly City BART station on Oct. 13, 2011. Photo by Jessica Goss. If BART officials receive positive feedback on a proposed plan to extend station hours Friday night, passengers may be able to actually catch dinner and a movie without having to run back to the station in fear of missing the train home. BART spokesman Jim Allison said that under the new plan BART services would be extended by 30 minutes to 12:30 a.m. Friday nights, but Saturday service would start 30 minutes later at 6:30 a.m. due to maintenance. An earlier version of the plan rolled out in June extended Friday services by one hour and delayed Saturday start time by one hour, but it received negative feedback from early morning passengers. BART Board of Directors member Robert Raburn said they are also seeking feedback on a proposal to add a bus service for early Saturday morning passengers. Allison said when BART was built in the 1970s it wasn’t designed to be a 24-hour system. Most public transportation systems have a third rail where trains can still move along toward their destination while other trains and rails receive maintenance. Everything from changing the light bulbs to grinding the rails for a quieter ride is maintained during BART’s off hours. BART representatives began handing out fliers Saturday detailing info on the two proposals. Allison said BART officials will look at the gathered data from surveys and feedback and decide on the proposals at a meeting in November with a planned testing phase possibly in February. SF State marketing major Dennis Ho, who used to ride BART regularly from the East Bay, said he thinks people will be on board for the extended service hours. SF State international business major Judy Singharath also said she would be happy if BART began running a little later on the weekends. She said she remembers how nervous she was back in January when she was stuck alone at a BART station in Oakland after the trains stopped running. Luckily a cab driver came by and offered her a ride to the station where her car was located.